IMHX2013 has proved to be the most successful materials handling exhibition yet, according to Korean forklift manufacturer, Doosan. Doosan hosted one of the largest stands at the Intralogistics show and flew in visitors from around the world to celebrate their most successful year ever. 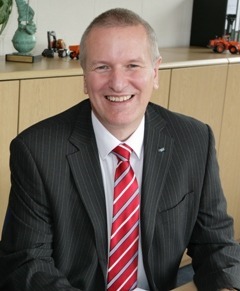 Traditionally Doosan has used the IMHX show as a launch pad for new initiatives, including in 2007 the introduction of its Pro-5 counterbalance range. This year was no exception with a new reach truck, warehouse equipment range and low emission diesel engines on display. Doosan introduced its new diesel 4.0t to 9.0t capacity trucks with the new Stage3B engine, exceeding all requirements of the new European emissions directive for vehicles in the 37 to 56-kW power range. The latest range of pedestrian and ride-on pallet trucks, the LEDH series, and the LEKF Low Level Order Picker, were also shown for the first time in the UK at IMHX. “We received several quality enquiries from potential customers, plus valuable enquiries for larger fleets, all of which makes the effort well worthwhile.” concluded Tim. Dealers from South Africa, Russia and mainland Europe were also invited for a gala dinner hosted by Tim Waples, with the guest of honour the Doosan Corporation Business Operations CEO, Jim Bemowski. Jim oversaw the restructure of the Doosan business and the Californian is the most prominent foreign CEO leading a Korean conglomerate. 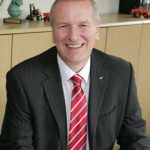 Bemowski has responsibility for nine business groups at Doosan Corporation and points to successes in Industrial Vehicles as a good indication of the company’s new focus. Meeting with dealers and assessing market trends forms an important part of Doosan’s overall IMHX strategy, with Jim on hand to present awards to the best performers. As for technological developments, Doosan remains pragmatic about the future application of new technologies.